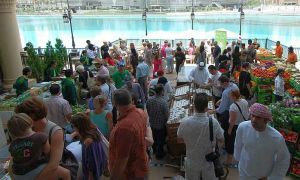 Baker & Spice Dubai and Emaar Malls Group have teamed up to launch the winter season of the UAE Farmers Market from December 10, 2010. Following on from its launch success in April, the market will be held at Souk Al Bahar every Friday during the cooler months (excepting December 31) from 10am-7pm. It is a selling market and all proceeds go directly to the farmers, which include: Abu Dhabi Organic Farm; Dar al Fatah Farm from Al Ain and Liwa; Salata Farms from Ras Al Khaimah; Nasser Al Refaee, bringing fresh produce from farmers in the UAE and Oman; Alfoa organic dates and sugarless date syrup from Abu Dhabi; and Showeib Organic Farms. Baker & Spice food consultant Yael Mejia said: “It’s a great day out for all the family and an opportunity to get to know local produce grown in this region. You will definitely taste the difference of buying local”. The market promises to deliver native produce, all picked and plucked just hours before the market, with seasonal fruit and vegetables currently including aubergines, red, yellow and cherry tomatoes, cucumber, courgettes, mini mumpkins, grapes, lemons, limes, coriander, parsley and mint. Baker & Spice has also recently announced the opening of a new kitchen and artisan bakery in Dukkan Al Manzil, Downtown Dubai. Located in the souk behind Al Manzil Hotel, Baker & Spice will specialize in bread and offer a small retail shop and café as well as home delivering and party catering. 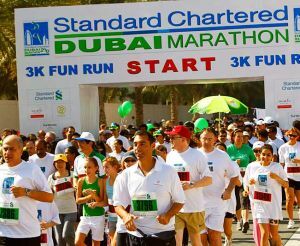 Dubai (UAE): With less than six months to go, registration has opened for the 2011 Standard Chartered Dubai Marathon, scheduled to get underway on January 21, 2011. Competitors looking to sign up for the full marathon distance of 42.195km, the popular 10km event or the 3km Fun Run can register now by visiting the event’s official website www.dubaimarathon.org. In order to give organisers enough time to finalise all logistics, entries will close at midnight on December 31. Held under the patronage of HH Sheikh Mohammed bin Rashid Al Maktoum, Vice President and Prime Minister of the UAE, Ruler of Dubai, and staged under the aegis of the Dubai Sports Council, the Standard Chartered Dubai Marathon has firmly established its position as one of the world’s leading road races thanks to prize-money of $1 million as well as a $1 million bonus for a new world record, courtesy of Dubai Holding. “The 2010 event was a great success with thousands of runners from all over the world joining us to race over what we believe to be the fastest marathon course on the international circuit,” said event director Peter Connerton. The Standard Chartered Dubai Marathon event continues to attract a healthy turnout of overseas runners as well as thousands of local and expat athletes based in the emirate. The 2010 event – which saw the men’s event won by Olympic legend Haile Gebrselassie – featured runners from countries as far afield as Mexico and Australia, while TV coverage of the race was seen by more than 200 million viewers worldwide. “The Standard Chartered Dubai Marathon is one of the highlights of our sporting and social year ,” said Jeremy Parrish, CEO UAE for title sponsors Standard Chartered. “Not only does it allow us to enjoy the talents of many of the world’s finest distance runners – many of whom will be using the event as they countdown to the 2012 Olympics – it also gives us the opportunity to maintain our active role in the community as part of our commitment to be ‘Here for good’. The launch of the registration process is the first of many announcements expected from event organisers as they finalise negotiations with elite athletes and sponsors alike. “We are looking into adding more activities around the event in 2011 to give runners and their families even more reasons to take part in the Middle East’s biggest marathon,” added Connerton. Dubai Department of Tourism and Commerce Marketing (DTCM) has announced the winners of the “Receptionist of the Year” award which is organized by DTCM in coordination with the Dubai chapter of Association of Front Office Managers and Assistant Managers. Yefgini Strokov from Ritz- Carlton Dubai was adjudged the winner, while Ms. Josimar Devlin from Millennium Airport Hotel Dubai came in second. Ms. Dian Mendoza from Le Royal Meridien Beach Resort and Spa won the third place. 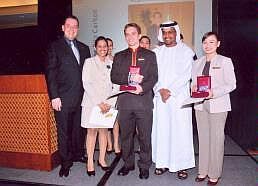 Fourteen contestants from various five-star hotels in Dubai took part in the competition, and the winner will represent Dubai in the international finals to be held in January 2011 in New Zealand. The competition was divided into two rounds – the first round was held on September 25th, during which the contestants were interviewed by the judging panel for 30 minutes each and asked several technical questions. At the end of this round, six competitors were shortlisted for the final round held on October 2nd. During the final round, the competitors were required to answer five questions and take part in role playing, simulating a real hospitality work situation. The performance of each competitor was graded by a judging panel and the final score was the sum of the performance grades given by each of the five judges. The judging panel included Ibrahim Yaqoot, DTCM’s Executive Director Corporate Support, Samy Abdul Fattah, DTCM’s Senior Specialist Corporate Support and Acting Director Training Solutions; Ms. Louise Oakley, Group Editor Hospitality of ITP; Ms. Cora de Conceicao-Stuart, General Manager of Media One Hotel and Mr. Steven Mueller, President of AICR Dubai, who was overseeing this competition. In addition, Tatiana Lomteva was the winner of the Receptionist of the year 2009. The first place winner was awarded AED 10,000 and a Letter of Appreciation; in addition he will be fully sponsored to represent Dubai at the international competition of the David Campbell trophy hosted by New Zealand. The winner of the second place received AED 5,000 and the third place winner received AED 3,000. All the six shortlisted finalists received a Letter of Appreciation presented by Ibrahim Yaqoot and Steven Mueller. 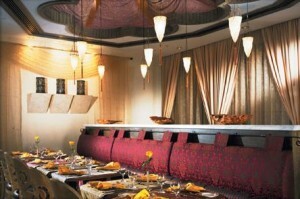 The Taj Palace Hotel Dubai will be holding its first ever wedding fair from 18-19 February 2011. Organised by Dubai based wedding planner Weddings & Events the Taj Palace Hotel will be hosting its first ever interactive wedding fair with a selection of the finest wedding businesses showcasing their services and products. Would-be brides and grooms can expect to find tips and advice on everything they need for their big day, from wedding cakes and attire to flowers and photographers. Exhibitors will be on hand to provide all the assistance that they may require to make sure their day is perfect. Representatives from the Taj Palace Hotel Dubai will offer personalised service and assist with the booking of the hotel as an exclusive wedding and reception venue. There will also be inspirational sessions designed to educate and advise visitors on the many different aspects that go into planning their big day, with wedding experts sharing tips and advice in a series of interactive presentations. Visitors will also get the chance to win a trip to the luxurious Taj Exotica Resort Maldives, and two night’s accommodation at the newly opened Taj Cape Town, superbly located in the centre of historic Cape Town, South Africa. The fair will run from 6pm to 10pm on Friday and from 10am to 7pm on Saturday, with complimentary admission, and an invitation-only session for ladies from 4pm to 6pm on Friday. ‘A first for the Taj Palace Hotel Dubai the wedding fair is more than simply a gathering of exhibitors and suppliers, it will be a completely interactive day with all participants involved in the whole event” said general manager Andreas Mueller. “We have aligned with a selection of wedding suppliers all of whom are keen to share their knowledge with brides and grooms to-be”. Sharjah, 20th Sept. 2010 — Robust demand for gold jewellery is set to spur sales at the upcoming MidEast Watch and Jewellery Show at Expo Centre Sharjah.The 29th edition of the show will be held at Expo Centre Sharjah from September 28 to October 2. According to the market report published by the organizers investment demand was the strongest performing segment during the second quarter of this year, posting a rise of 118 per cent to 534.4 tonnes compared to 245.4 tonnes in Q2 2009, according to World Gold Council. “We are expecting strong demand for gold this season with 2010 consumption looking to surpass levels to reach a five-year high as gold is the world’s strongest tangible investment,” said Mr Saif Mohammed Al Midfa, Director-General of Expo Centre Sharjah, ahead of the Mideast Watch and Jewellery Show. According to World Gold Council, global jewellery demand remained robust in the second quarter of 2010 with consumption totalling 408.7 tonnes. Total gold demand in the second quarter rose by 36 per cent to 1,050 tonnes, largely reflecting strong gold investment demand compared to the second quarter of 2009. Gold sales at the MidEast Watch and Jewellery Show will be seen as an indicator for the entire sector since the fair is held ahead of the festival season that begins with the Indian festival of Diwali, which is followed by Christmas and New Year. “We are expecting the MidEast Watch and Jewellery Show to provide further boost to the buying season in the region. Sales have started picking up during Eid Al Fitr, and the ensuing festive season will enhance the demand further. The show is perfectly timed to benefit from this festive buying season,” said Mr Midfa. Dubai to host 3 events next Nov.
DUABI, June 27th, 2010: Dubai will host three impactful events in one venue gathering the best minds in Healthcare IT Leadership, Management, and Insurance in the Middle East. The 2010 HIMSS Middle East Health IT Leadership Summit, HIT Management Conference and Health Insurers Innovation Forum, are scheduled for 8-10 November 2010. The Healthcare Information and Management Systems Society (HIMSS), in a press release, said the event is set to showcase the latest advancements and trends in Healthcare IT and Insurance Innovation. “We look forward to returning to the Middle East region in 2010 to continue our collaborative efforts with health IT leaders in the region,” said H. Stephen Lieber, CAE, HIMSS President/CEO. ” The rapid growth in healthcare services in the region demands the educational and networking opportunities that HIMSS provides.” The Dubai Health Authority will also showcase its progress in digitizing the delivery of patient care to increase quality and decrease cost with an educational focus on global best practices in health information technology. It’s that time of year again when hearts beat a little faster, palms get a little sweatier and wallets empty a little easier. It’s the Dubai shopping season, the time when experienced sales shoppers can bag a bargain and wardrobe basics can be picked up for a song. There are two ways to get the best from the sales. In the first, shoppers wander into a shop to happily browse. I like to call this the “scatter gun effect”. It’s the ultimate in impulse shopping, where items you never knew you needed suddenly seem irresistible with 50 per cent off. It’s a fun way to spend a few hours and it can help you unearth some unexpected bargains. It’s also a great way to suddenly decide to update your bed linen or stock up on basics such as shirts, T-shirts and jeans, as these items are always heavily marked down. The other approach is that of the ‘Military Strategist’. This shopper plans exactly what, where, and how much they will be spending. They earmark key pieces and stalk them like a hunter does its prey. This is certainly the most efficient way to snare a bargain — although it lacks the thrill of the unexpected find. This is best for expensive purchases, such as the Jimmy Choos that have been lusted after all season but have until now been out of reach. It takes nerve and research, but wonderful things can be picked up for less than half the original price. The key to get the best out of the sales is to adhere to a few basic rules. Stick to these and you will avoid costly disasters and, fingers crossed, pick up a bargain that will have all your friends green with envy. Always remember that sales rely on impulse buys as we get caught up in the moment and spend wildly. So be picky. The best way to guard against unsuitable purchases is to ask yourself: Would you pay full price for it? If the answer is no, put it back. If the answer is yes, then congratulations, you have bagged a bargain. The next question is, does it fit? If you have to drop a dress size, grow a foot taller or suddenly transform into Gisele Bundchen, then forget it. No matter how pretty it is, if it doesn’t fit you, you will never wear it; and if you never wear it, it’s a waste of money. So put it back. Next question: What will you wear it with? Will it match with things you already own or do you have to buy an entire new wardrobe or redecorate your house to make it work? If the answer is yes, put it back. Does it suit you? Just because your friend (Kate Moss) has one, will it look as good on you? Be honest and if you can’t trust yourself, then take a friend who will tell you. Sales happen because shops want to clear old stock before the new stock arrives. They have already spent lots of money and are now trying to recoup as much of the investment as possible before the moment passes. That’s why the prices keep dropping as the sales go on for longer. If you can hold your nerve and wait it out, you can pick up absolute bargains as the sale draws to its end. The major downside of this approach is that there is a real risk that someone else may buy it before you. As the sale draws on, it’s worth trying to haggle a further discount. Clearly, this is not going to work on the most expensive item in the store on Day 1 of the sale but if it’s still there on Day 25, take a deep breath and ask for their best price. You may just be amazed at the response. Another way is to carefully check items for marks and scuffs. Customers are notoriously rough on clothes (and shoes in particular) and many items end up smeared in make-up or scuffed. Look at the article carefully and judge for yourself if the damage can be repaired, then point it out to the sales team and politely ask for a discount. Be fair in your request. No store is going to give 80 per cent off for a smudge of make-up that can clearly be dry-cleaned, but a popped seam could warrant a few dirhams off. Discounts such as these are at the manager’s discretion so be nice and friendly, but question their decision if the answer is no. Try bulk buying. If you find two or three things that you like, try asking for a discount if you buy them all. This may not work in the big department stores but smaller privately run shops will be more open to negotiation. This can be another good incentive for taking a friend with you, as you can haggle if you are both buying a few items. Also, try asking for the cash price or if there is a discount for cash. This can sometimes work on larger purchases and again if you are buying more than one piece. But the best part of shopping at the sales is exactly that; shopping at the sales and the thrill of the chase. So try and have fun. 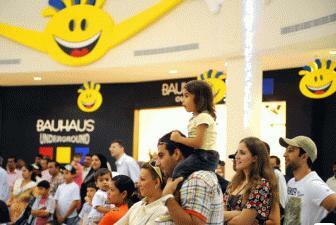 World of Stories at Mercato: Children can see their favourite fairytale show live on stage at 4.30pm, 5.30pm and 7.30pm. World of Stories will go on till June 29 and is open to visitors for free. This year’s event features a 3-D theme and includes characters such as Sinbad, Sleeping Beauty, Pinocchio, Snow White, Bambi, Cinderella. Art and craft activities are also held from 3-5.30pm and from 6-8pm. In addition, storytelling will take place between 3 and 3.30 pm. And from 6.15-7.10pm. Kids can also get their picture taken with a caterpillar mascot. Modhesh World at the Airport Expo Dubai: Featuring more than 40 themed zones, kids can enjoy attractions such as a huge fun fair, a scooter zone, the Modhesh Magical Forest, a 4D cinema display, an inflatable zone, magic planet zone and a minizoo, in addition to many other entertainment areas. Parents have options to keep their children occupied while they watch the Fifa World Cup matches on wide screens located at the Sports Zone for free. Modhesh World is open till August 7. Doors are open from 10am-10pm (Saturday to Wednesday); 10am-midnight (Thursdays) and 3pm-midnight on Fridays. Tickets cost Dh10 for adults and Dh15 for children. Fun-filled activities at Oasis Centre: Throughout the DSS, various all-family activities are lined up, including balloon-tricks for kids, exclusive international acts such as the Circusfera show, Soccer Trickster, Rola Bola Danny Show, Soccer on Rollers, Green Gymnastics and a Cowboy Rope Trickster. Foosball Frenzy game competitions will also be held at the mall. Horse and camel riding and mini zoo at Modhesh World: This year’s mini zoo has expanded to include more species on display. Children can hop on to camels and horses, take pictures with a falcon, or feed birds and animals. The zoo houses a number of animals and birds, including turtles, iguanas, doves, parrots and eagles. Rides cost Dh15 and pictures can be taken for Dh10. Visitors can have their pictures printed on mugs with animal-shaped handles for Dh25. Spending your money at the mall this summer could bring you more shopping rewards. Shopping-lovers get a chance to win Dh200,000 every week each time they spend Dh300 at the Mall of the Emirates, Deira City Centre, or the new Mirdif City Centre. Tech-savvy kids can join an online kids club to stay updated on activities, promotions and exciting events. Log on to www.coolkids.ae for details. Kids and animation movie fans will be able to watch the premiere of Toy Story 3 at CineStar Cinemas. If you’re a football fan, all you have to do to win prizes is to walk around at one of the three malls listed above wearing your favourite team’s jersey. And you don’t have to worry about missing the final matches, as a number of outlets will be screening the matches live. The Sheila & Abaya Fashion Show: July 8-11 at the Fashion Catwalk. Mini Bladi Exhibition: July 17-26 at the Gold Souk Atrium. Kids Wonder Talent Show: Until June 26 and July 12-14. Circus Fera Show: June 28-30 and July 15-16. Butterflies Show: July 27-28 and August 5-7. Yellow Speed Team: July 29-31 and August 3. The mall will also host oud and qanoon shows, saxophonists, Spanish guitarists, mime artistes and living statues. The All that Glitters is Gold promotion runs from until August 7. What can be better than indulging in a relaxing and rejuvenating spa treatment this summer? Ladies and men of all ages can take advantage of DSS Spa Packages and treat themselves, friends or their loved ones to one of the packages on offer this summer. Spa-lovers can choose from one of 40 Dubai spas participating in the promotion and go to the one nearest to their home. The packages include discounts of up to 50 per cent, two-for-one offers and complimentary treatments such as body scrubs, mud baths, reflexology sessions, Ayurveda therapies, Moroccan baths, Swedish and Thai massages, beautifying and detoxifying treatments and various other specialised therapies for both men and women. Wives can also treat their husbands to a massage or grooming session at any of the spas included in the promotion. This year’s Spa Packages offer special treatments men such as anti-fatigue massages and salon grooming packages. There at least 40 spas taking part in the promotion. DSS also offers alternative events so everyone can find something they like, no matter what they’re interested in. Middle East Junior Chef of the Year: Until June 29 at BurJuman. The event celebrates the works of 600 and more chefs from star hotels across the GCC. They gather in Dubai to showcase their finest preparations and compete in front of the jury consisting of master chefs from around the world. The World Cup Tent One: Football fans can head to the Dubai Fountain at the Burj Khalifa area to watch the World Cup games and support their favourite team. The One marquee has been built especially for the Fifa World Cup. It has 35-inch plasma screens in addition to two 2×3-metre big screens that will telecast matches live. The two-floor venue will also offer visitors a selection of food and beverages and sheesha. Skating-rink at Arabian Centre: The 80,000-square-metre mall will hold performances by professional skaters from Russia at its newly opened ice-skating rink. The event will also give an opportunity for one fan to skate alongside the professionals and learn skating from experts. The mall will also offer training courses on skating at the rink for beginners who want to have a go at the fun sport. Dubai, 17 June 2010 – Solid demand growth in China, India and emerging Asian economies, including the Middle East, are the key factors that will shape world oil markets and prices in 2010, experts said today at the Oil ‘&’ Petrochemicals Market Briefing. The event was organised jointly by Dubai Multi Commodities Centre (DMCC), Platts and Thomson Reuters, and held at the Almas Tower in the Jumeirah Lakes Towers (JLT) free zone. “Growing confidence in a global economic recovery had inspired hopes of rising oil demand in early 2010, but the Eurozone crisis and a strengthening dollar have encouraged continuing volatility in oil prices,” said Malcolm Wall Morris, CEO, DMCC. “We anticipate that long-term demand growth in China, India, emerging Asian economies and the Middle East region will be the key factors determining the shape of oil markets and prices through this year.” Mr. Wall Morris emphasised the various factors that have impacted oil prices, including currently high inventories of oil products, the excess shipping and refining capacity left over from the 2008-2009 demand dip, and China and India’s increasing prominence as oil products exporters. During his speech, Mr. Wall Morris also highlighted the relevance of Dubai as the central hub in the GCC oil trading community. He added that the rapid growth in downstream projects for refineries and product blending and upgrading will continue to enhance the roles of Jebel Ali and Fujairah as major oil trading and storage hubs. In addition, Mr. Wall Morris highlighted the increasing prominence of the Almas Tower and larger Jumeirah Lakes Towers free-zone community, where the event was held, for participants in the energy trade. “DMCC’s efforts to establish the JLT free zone as the principal hub for the commodities trade, including energy companies, continue to bear fruit. JLT is now home to more than 200 energy companies and a total of more than 2,250 companies and over 10,000 residents,” he said. “So far this year”, he added, “DMCC has registered an average of more than 60 new companies per month at JLT, with registrations up more than 40 per cent in the first half of this year compared to the same period in 2009.” Key energy companies registered at JLT include Lukoil, one of Russia’s largest oil companies, SOCAR, Azerbaijan’s national oil company, PTT, Thailand’s National Oil Company, Reliance, India’s largest independent oil refiner, and Topaz Energy and Marine, one of the world’s leading marine services and oil and gas fabrication companies. In addition to providing the physical infrastructure to support energy companies operations, DMCC was also the driving force behind the creation of the Dubai Gold ‘&’ Commodities exchange which is the region’s largest commodity and currency derivative market. In 2008, DGCX listed the two crude oil global price benchmarks, namely the WTI and Brent contracts, making these contracts directly available to the world’s premier producing region for the first time. Speaking about the outlook for Asian Oil markets, Kate Dourian, Middle East Editor at Platts, spoke about the likelihood of constrained production in the future. She, however, highlighted the prospects of strong demand due to renewed growth in China and elsewhere in Asia. Ms. Dourian also examined the effects of simmering geo-political tensions, demand-supply projections and the role of Iraq in helping to meet future demand during her address. While reviewing the Asian Petrochemicals market, Quintella Koh, Managing Editor, Asia Petrochemicals at Platts, spoke about the market outlook for ethylene, propylene and polymers in 2011 with a focus on Asian markets, including China, India, Thailand, Singapore and Vietnam. The rise of swaps and futures in Asian polymer markets and the Asian Aromatics market outlook were also addressed during her presentation. Yaw Yan Chong, Senior Energy Correspondent, Thomson Reuters, spoke about the outlook for the Asian fuel oil market at the event, with a focus on supply patterns targeting the West and Middle East. The trends in demand focusing on Singapore, China, Vietnam and the Middle East were also reviewed by Yaw Yan Chong. Platts, a division of The McGraw-Hill Companies (NYSE: MHP), is a leading global provider of energy and commodities information. An independent provider, Platts serves the oil, natural gas, electricity, emissions, nuclear power, coal, petrochemical, shipping, and metals markets from 17 offices worldwide. Thomson Reuters is the world’s leading source of intelligent information for businesses and professionals, combining industry expertise with innovative technology to deliver critical information to leading decision makers in various vertical markets across 100 countries. Dubai on March 28, HH Sheikh Hamdan bin Rashid Al Maktoum, Deputy Ruler of Dubai and Minister of Finance, today inaugurated Careers UAE 2010 exhibition of the largest recruitment, training and education in the country, which combines in its tenth session, some of the best recruiters and thousands of job seekers under one umbrella . His Highness toured the exhibition halls at the Dubai World Trade Center and reviewed the wings institutions and companies involved and the potential and the services provided in support of human resources and skills of citizenship. Attended the opening ceremony .. HE Dr. Rashid Ahmed Bin Fahad, Minister of Environment and Water, Saeed Al Tayer, Managing Director and Chief Executive Officer of Electricity and Water Authority Dubai, Mattar Al Tayer, Chief Executive of Roads and Transport Authority and Hussein Nasser Lootah, Director General of Dubai Municipality, Abdulrahman Al Saleh, Director of the Department of Finance, Government of Dubai and Helal Saeed Al Marri Chief Executive Officer of Dubai World Trade Center and a host of dignitaries. The event which runs until March 30 under the patronage of His Highness Sheikh Mohammed bin Rashid Al Maktoum, Vice-President, Prime Minister and Ruler of Dubai. And contribute to Careers UAE in support of government efforts to increase the number of UAE nationals working in the private sector and raise their professional and organized in conjunction with the development and employment of national human resource “development”, Higher Colleges of Technology, Zayed University and the University of United Arab Emirates. The show features 20 companies for the first time, including resettlement and the University of Sky Line and ABB AG and 4 as well as a large number of ministries, companies and organizations including Al-Futtaim Group and the Electricity and Water Authority Dubai, Dubal, Emirates Airline and General Electric and the Al Ghurair Group, resources, and Noor Islamic Bank and the Ministry of Finance. The exhibition consists of ten sectors, including distributed Exhibitors are communications, training and human resources, universities, employment, banking, finance, business groups, government institutions, parastatals and private transportation, oil and gas and ministries. The leading companies in the area of training, employment and education seminars and workshops free of charge on the labor market to visitors from job seekers such as guidance and Bayt.com, the International Association of Students of science and economy and trade, National Rehabilitation Center and the Emirates Foundation of nuclear energy. Sharjah, March 23rd, 2010 The Sharjah Commerce and Tourism Development Authority (SCTDA) has announced to participate in the 27th Swedish International Travel and Tourism Fair (TUR 2010), which will take place at the Swedish Exhibition Centre in Gothenburg, from 25 to 28 March 2010. The emirate’s participation in this event, represented by the SCTDA, is intended to boost Sharjah’s presence in the Scandinavian market, which is among the most significant target markets that the SCTDA has been planning to reach and impress over the last few years. Media coverage of TUR 2010 is expected to be extensive, as more than 465 media representatives will cover the participation of over 1,200 exhibitors from 100 countries, as well as over 1,900 industry decision-makers. The SCTDA has stressed the importance of organizing the emirate’s participation in this important international fair, which is considered the most prominent international tourism exhibition in the Scandinavian market. This participation helps achieve the Authority’s goal of opening up new markets to increase the flow of tourists into the emirate. Thanks to its visionary promotional strategy, the Authority was able to increase the number of Scandinavian tourists visiting Sharjah to 17,000 in 2009, a 47 increase from the 11,000 that visited in 2008. In its fifth participation at TUR, the SCTDA aims to further expand its international presence, introduce Sharjah’s tourism products to the Scandinavian market and explore ways to increase the flow of Scandinavian tourists into Sharjah. These will include such initiatives as developing competitive tourist packages for this region, promoting Sharjah as a favourable investment destination, and raising awareness of Sharjah’s investor-friendly climate and sound infrastructure among the Scandinavian investment community. Through its presence in the Scandinavian market, the SCTDA will seek to increase Scandinavian tourism in the emirate. The most prominent of these is Scandinavian airlines’ tendency to operate transit flights to the Far East through Sharjah International Airport, especially in the winter season. The Authority aims to achieve a 5-10 percent annual increase in the average number of tourists from Scandinavian countries visiting Sharjah. Recent statistics have shown an increase in the number of Scandinavian tourists visiting Sharjah in the past few years, in response to the emirate’s growing reputation as a world-class destination, featuring a multitude of unique tourist attractions.